This update is a sort of fix, it fixes the id issue, but your immersive engineering chickens will change because of the ids changes. but you should no longer get the crash. Adds new chicken to fill in a missing id that caused chickens to crash. The Bullet Chicken. Added new things, Top Secret ?? Fixed how you get easter egg chickens. Fixed all those chickens looking like ducks. Well most of them. Added a error catching for null ItemStacks when loading chickens, Now gives its default item. Moved Textures around into their specific mod names to better identify them. Botania Configs may have been messed up from the last update... you can delete your file and let it regenerate. ManaSteel chickens were dropping wrong item. Fixed Crash with newest version of Chickens Mod. Is Dependent on Version 4.1 of Chickens mod now. Added Base Metal Chickens in. Currently only the lower level metals. Updated Language files for some misspellings. 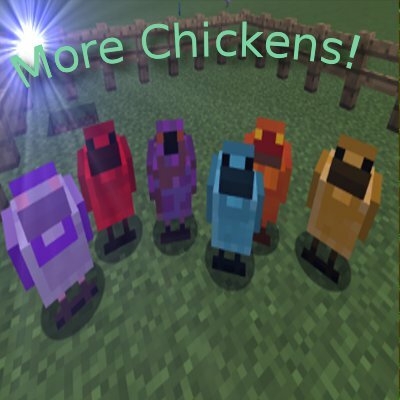 Adds Tinkers Chickens and Draconic Evolution Chickens to the Chickens mod.